Primates are exceptionally visually oriented mammals. Adapted to a life in the trees, their evolution has favored forward-facing eyes for enhanced depth perception (handy for accurately grasping branches) and has reduced their reliance on smell (hence the flatter faces). Reliance on sight has led to another development in our lineage: color vision, or the ability to distinguish different wavelengths of light in the visual spectrum Primates, as well as other animals, achieve this using cones or the light-sensitive cells in the eyes; the more distinct cones a primate has, the more colors it can see. However, not all primates are created equal when it comes to color vision. To understand the ins and outs of primate color vision, I interviewed Dr. Amanda Melin of the University of Calgary. Dr. Melin’s lab focuses on sensory and foraging ecology in New World primates (her primary field site is in Costa Rica), with one of their interests being how sensory cues (including vision) influence foraging behaviors and food choice. As I was very interested in primate vision and foraging ecology, I asked her some questions on primate color vision and some of its interesting variability, as well as her own research findings. Ready to study primate color vision in the Peruvian Amazon this summer? Can you explain to our readers what terms like “trichromatic” and “dichromatic” mean with regards to vision? How do Old World (Africa and Asia) and New World (Central and South America) monkeys differ in these visual characteristics? AM: “Trichromatic” refers to a color vision system based on three different types of cone cells in the retina. Each cone type is maximally sensitive to different wavelengths of light, roughly corresponding to blue, green and red hues. In dichromacy, there are two types of cones cells. In primates there [is] one blue-sensitive type and other[s] sensitive to longer wavelengths (greenish to reddish, depending on the species). However, with dichromatic color vision, the visual system cannot tell apart long wavelengths of light. This is commonly referred to as red-green colorblindness. All Old World monkeys have trichromacy due to the occurrence of two distinct genes on the X chromosome coding for green-sensitive and red-sensitive opsins (opsins are a part of the cone cell that influences color sensitivity). In New World monkeys, there is only one locus for the opsin gene on the X-chromosome. However, there are several different genetic variants (alleles) in populations. Females with two different types of opsin genes (heterozygotes) have trichromacy similar to Old World monkeys, while all males and females with two of the same genes (homozygotes) are dichromats. The majority of placental (not monotreme or marsupial) mammals on this planet are considered dichromatic, with the majority of primates being a notable exception. Why might natural selection favor primates to develop trichromatic vision? AM: Primates are typically active in daylight, have many derived features of their visual system, and they are very reliant on sight as a sense. Together these factors might have favoured the persistency of trichromacy. The acute vision of primates (ability to resolve spatial detail) might have rendered trichromacy useful after the necessary genetic variation occurred by chance. For example, acute trichromacy might have allowed primates to more efficiently find and select desirable food (ripe fruits, young red leaves) or avoid yellowish feline predators in a greenish forest, improving their fitness. Reddish social signals are also important to many primate species. Trichromacy may not have been as useful to other mammals with poor vision, as those mammals may not have obtained the same information with poor spatial vision and/or the extra information didn’t affect their fitness because they were heavily reliant on other senses (hearing, smell etc). 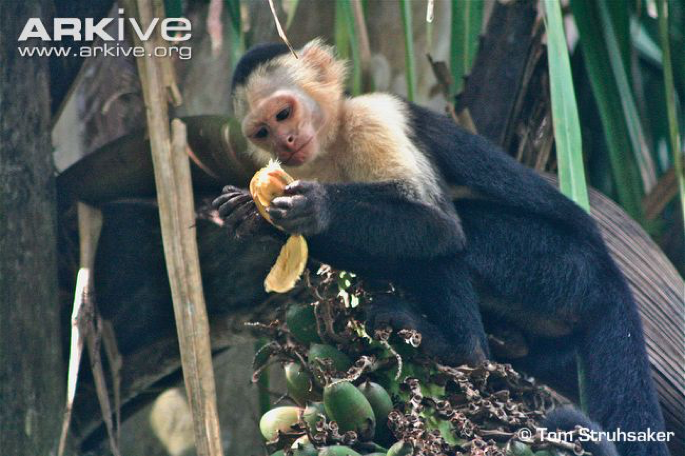 Many of the populations at your study site in Costa Rica (C.capucinus: white-throated capuchins or A. geoffroyi: black-handed spider monkeys) have individuals in the same population with either dichromatic or trichromatic vision. If dichromatic vision exists in these populations, is there an adaptive advantage in being colorblind or do these individuals make up for their lack of color vision with increased levels of other sensory behaviors (i.e. sniffing, tasting, touch, etc.)? AM: We see evidence that trichromacy improves fruit foraging efficiency but that monkeys with dichromatic vision are more efficient at capturing cryptic, surface-dwelling insects. So, each phenotype seems to have advantages under different context, which likely impacts the nature of balancing selection maintaining the color vision variation. In our study of capuchin monkeys we find that females with dichromacy have similar reproductive success to those with trichromacy. We also see behavioural differences – dichromatic monkeys do seem to sniff fruits more often! However, trichromats frequently sniff fruits as well, suggesting that color information alone is not always enough to guide fruit selection. What is the deal with howler monkeys and their vision? What makes their visual abilities so different from the other New World monkeys, and why do you think this visual trait is favorable for them to have? AM: Howler monkeys have independently evolved the type of routine (everyone has it) trichromacy seen in Old World monkeys and apes. 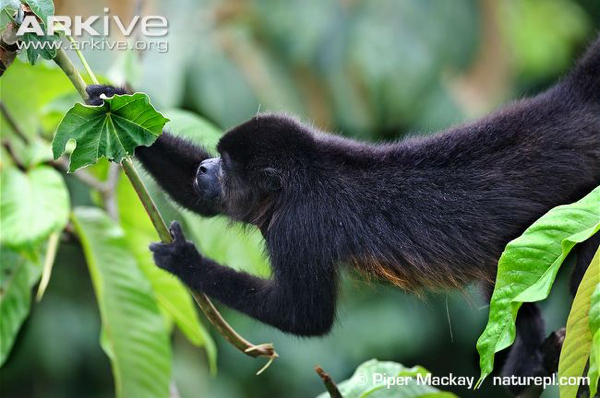 Among howler monkeys, all males and females can tell the differences among reds, oranges, greens and yellows. Routine trichromacy might have been favoured given their reliance on young red leaves and fruits, together with a low amount of insects in their diet. Alternatively, it might be that other species of New World monkeys have not had the gene duplication that occurred in howler monkeys. Have you noticed if howler individuals rely entirely on sight when consuming their foods or do they also perform other sensory exploration behaviors (i.e. sniffing, touching, tasting, etc.)? AM: You ask a great question! My colleagues and I are interested in assessing whether howler monkeys and species with trichromacy have different behaviours when assessing the same foods. I hope to have that answer one day in the near future. It seems that the investigation of New World monkey color vision has greatly increased in the last 10-15 years. However, early studies (such as ones with captive animals and colored Kix cereal retrieval) seem to have been outnumbered by field studies with computer modeling, genotyping, and behavioral follows. In your opinion, what is the importance of field studies addressing color vision as opposed to those in captive environments? AM: I think the two approaches are complimentary. There are so many variables that cannot be controlled for in observation of wild primates – it would be exciting to see experimental approaches be informed by (e.g. use naturally occurring fruits), and in turn inform, wild studies more directly. Both can make unique contributions. What direction do you see your research moving in the future? 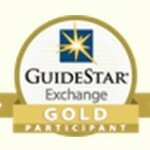 Are there any new studies or ideas that you are particularly excited about? AM: Recently, I have been very interested in understanding when, why and how primates integrate information from the different senses during food assessment. I would like to know how this is influenced by the sensory phenotype (e.g. taste and odor sensitivity, color vision type) of the primate, as well as the traits of the foods being investigated. I am also very interested in how touch is used during food assessment, the extent of interspecific variation in using touch to assess foods, and which factors influence this (e.g. morphology of hands, protective coverings of foods). However, there are many exciting questions in the field of sensory and foraging ecology, so it is difficult to pick! If you are interested in any of Dr. Melin’s work or the work of her collaborators, check out the papers below to get you started on your journey to further understand primate vision! Cheers to the discoveries of primate sensory ecology and the thrill of new discoveries yet to come! Kawamura, S., Hiramatsu, C., Melin, A.D., Schaffner, C.M., Aureli, F., & Fedigan, L.M. (2012). 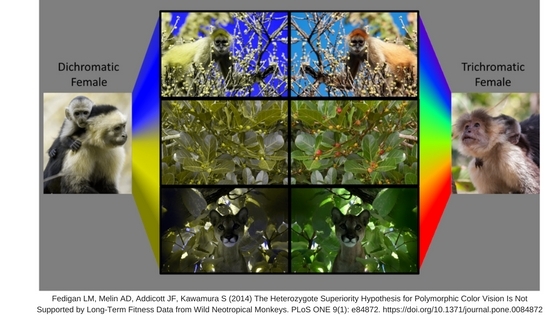 Polymorphic color vision in primates: evolutionary considerations. In Post-genome biology of primates (pp. 93-120). Springer Tokyo. Melin, A. D., Fedigan, L. M., Hiramatsu, C., Sendall, C. L., & Kawamura, S. (2007). Effects of colour vision phenotype on insect capture by a free-ranging population of white-faced capuchins, Cebus capucinus. Animal Behaviour, 73(1), 205-214. Hiramatsu, C., Melin, A. D., Aureli, F., Schaffner, C. M., Vorobyev, M., & Kawamura, S. (2009). Interplay of olfaction and vision in fruit foraging of spider monkeys. Animal Behaviour, 77(6), 1421-1426. Melin, A. D., Hiramatsu, C., Parr, N. A., Matsushita, Y., Kawamura, S., & Fedigan, L. M. (2014). The behavioral ecology of color vision: considering fruit conspicuity, detection distance, and dietary importance. International Journal of Primatology, 35(1), 258-287.